Despite the direct link between social interaction and positive effects on our well being, the stigmas and concern traditionally surrounding personal relationships at work can make navigating friendships in the professional sphere a bit confusing. Although uncomfortable, this juxtaposition makes sense. Just as companies want to encourage productivity and success, they also rightly want to prevent inappropriate behavior. Harassment, favoritism, abuse of authority, and conflicts of interest are examples of downsides that can stem from close social rapport between coworkers. In an age where people are driven both by career and personal well being, striking a healthy balance in relationships at work has never been more essential. In fact, the one factor that leading scientists and psychologists agree on is that social relationships represent the most accurate predictor of overall happiness. Workplace friendships pose challenges that private, social interactions do not experience. You have to strike a balance between your personal needs and the needs of the workplace for harmony and contribution. Here are five ground rules that give you guidance for handling workplace friendships. Although research shows that even minor chit-chat with coworkers can lead to significant gains in productivity, no one can afford to spend all day shooting the breeze. It’s important to recognize when social interaction with friends turns into a distraction, ultimately derailing your ability to accomplish your goals. Setting aside time to connect during a break or lunch can help your schedule fall in line while at the same time nourishing your innate need for social interaction. If friendships cross hierarchies, it’s also important to recognize the optics of that relationship. You need to manage boundaries appropriately so as not to appear to be leveraging relationships unfairly or creating an environment of favoritism. Leaders especially need to understand that overly familiar relationships can damage their credibility and actually undermine their long-term success. It’s completely natural to want to collaborate with friends when you’re working on any kind of team assignment. On the other hand, it’s also just as important to put heads together with other people outside of your immediate circle. This helps to avoid the same group think and open your imagination to approaches outside of your typical sphere of influence. It’s okay - and even productive - to join forces with friends; just make sure that you’re including other colleagues, too. One of the main concerns employees worry about when it comes to witnessing a close relationship between other coworkers is hearsay. Your coworkers might wonder if you are talking behind people’s backs. Especially in the case of a manager-employee relationship, they worry that you are swapping tidbits you shouldn’t share. Even if it just looks like you are spreading rumors or laughing at coworkers, for example, it can make people nervous and can negatively impact your credibility. If you sense a conversation with your friend starting to turn negative, try to keep things on track or suggest connecting outside of work hours. The best way to avoid bias - or even perceived bias - is to intentionally treat each team member with equal care, consideration, and respect. Make sure you truly listen to coworkers, and not just friends, when they bring up ideas or share information. It’s incredibly crucial to make each individual feel valued by giving them the attention they need. As a leader, you might also want to consider whether you should even have a close friend on your direct team. It might create an impression that will add additional barriers to the contributions and productivity of the rest of the team. If you do have a close friend on your team, be careful to avoid any special treatment of that person so as to ensure equal airtime for all team members. It may seem foreign or unnecessary, but understanding what you need from the people in your organization can help clarify your own role and how you can thrive in it. You’ll feel better prepared when a question comes up. You'll feel more secure knowing that you have a network of people whom you can rely on for help with specific issues. You may even improve the quality of your own resource value when colleagues need help. Awareness of your needs gives way to insightful understanding, which in turn leads to effective action. At their core, organizations are simply a network of people. The better balanced the relationships between those people become, the better the organization functions. 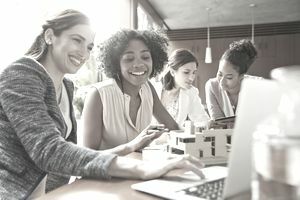 Workplace friendships can clearly be healthy and everyone in your organization is responsible for doing their part to ensure contentment remains high.